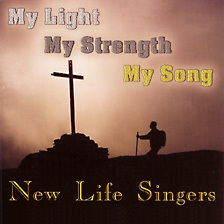 The latest New Life Singers album, on CD and DVD! The third release from the New Life Singers includes 15 songs celebrating our Lord and Savior Jesus Christ. And now for the first time, you can not only enjoy listening to this album of worship, but watch the New Life Singers on DVD! We trust that My Light, My Strength, My Song will point you to our Lord, encouraging you to depend on Him to be your light, your strength, and your song. Order your own CD or DVD today from our online store!